Hetrogenous’ STAYTM platform enables secured connectivity and control of real & virtual systems through the Internet over any hardware, device and network interface, enabling enterprises to capture critical performance data across key assets and infrastructure, extract and visualize actionable insights with intelligent analytics, and provide access via APIs and industry standard protocols. 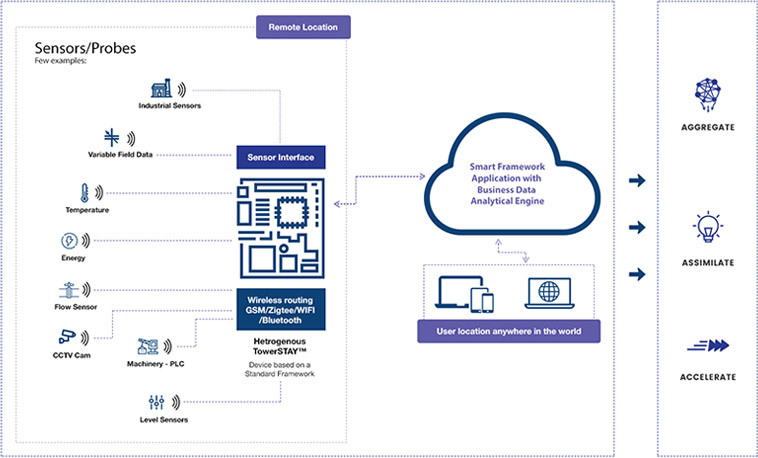 The Hetrogenous STAYTM Framework and APIs enable the connected cloud software to adapt to the transformed hardware of any industry and create new and powerful Locate-Sense-Interact-Control applications that can be mapped to the specific needs of all industries. Integrated hardware that monitors sensor data from STAYTM nodes, performs edge processing, connects to the STAYTM Cloud, and allows remote control of key operations through the nodes. Powerful data analytics platform that enables real-time data aggregation and secure mining of massive amounts of data. Flexible – Public and private cloud interfacing via multi-radio routing gateway over any PHY/MAC layer for secure data mining and analytics in real-time. Data dashboard accessed through mobile thin-clients provides remote tower administrators with an in-depth view into the various aspects of a site through contextualized and visualized data along with remote controls. STAYTM Platform is a modular hardware solution that can fully function on its own or in concert with other units. STAYTM Platform can be scaled both vertically and horizontally, with an innovative configuration database that can be seamlessly integrated to other business areas. STAYTM Platform is built using an open architecture with a platform-independent data-driven framework, allowing it to evolve as technologies change. Hetrogenous’ STAYTM Platform enables enterprises to drive the quality of their services at any time, anywhere, across any service model. Hetrogenous products are uniquely positioned to help operators and service providers of all sizes to leverage the power of the “Always On” mobile Internet.